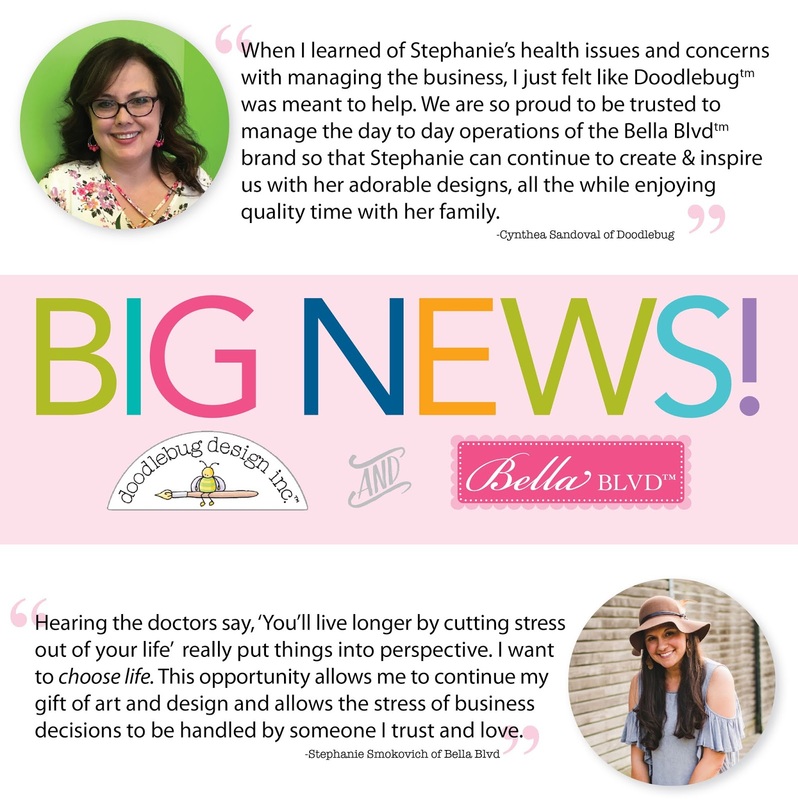 Doodlebug Design Inc Blog: We have a big announcement!!! We've been keeping a secret.....and have some BIG NEWS to share! Nothing around here will change, you’ll still see loads of inspiration and colorful products from us! And Bella Blvd’s releases will be featured just like they have been on the Bella page. We are so thrilled about this partnership and can’t wait to combine our talents and love for this industry!! Help us celebrate by sharing the news using the #DBandBBunite on Facebook and Instagram. We will each choose a winner on Monday from our shares and comments, and send a boatload of Doodlebug & Bella goodies to one lucky person! This is absolutely fantastic news!! When I first heard about Stephanie's diagnosis, I must admit I was wondering what would happen to Bella Blvd. Because honestly, owning a business is hard work. It is alot of stress. And while people may think scrapbooking, papercrafting is a stress release, yadda yadda (and it is ) it is stressful. To be on the other side of providing us crafters with the awesome products that are available to us? I can only imagine the stress level. And to have this diagnosis to boot?? Yeah. That is stressful. But one thing I do know about crafters and the industry? The generosity. To help one other. I hoped that Stephanie would receive help from a company that can her business. I am so GLAD that Doodlebug Designs is the one!! It warms my heart. This is such good news. I hope that Stephanie can rest and concentrate on her health and recovery knowing that Bella Blvd is in good hands. Really good hands. Bless you.